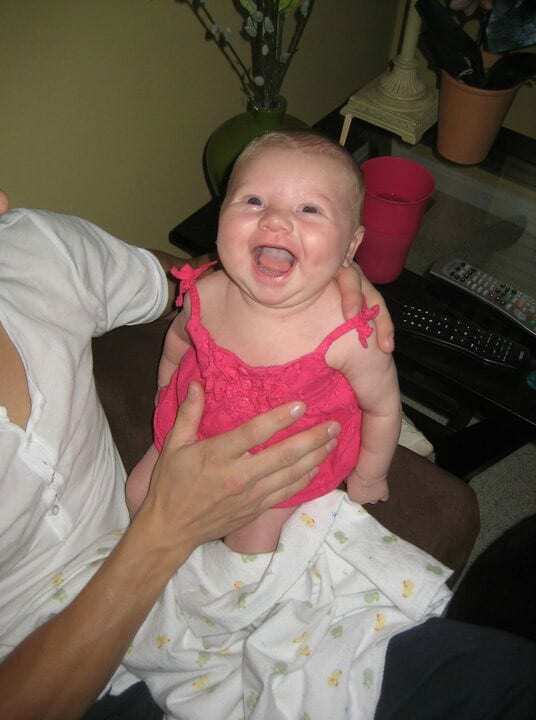 I look at this picture of my two month old granddaughter every day to remind myself to take time to laugh. I will admit that I am the serious type that can easily get wrapped up in my work. At the same time, I realize that this “all work, no play” attitude is not always beneficial for me or for HG Logistics LLC, the Cincinnati based third party logistics company I have worked for the past four years. There are studies that have proven that employee laughter is a sign of a healthy, productive company. According to Mary Rau-Foster in her article, “Humor and Fun in the Workplace,” laughter can help break up boredom and fatigue, as well as dissolve conflict and tension that can be building in the air. When people are having fun, they can be more creative, more willing to pitch in and help, and overall better communicators. Laughter cannot only help lift employee morale, but it can also improve your physical health, which Mary Rau-Foster also addresses is her above mentioned article. She states that a good hearty laugh can burn up to 3 1/2 calories, can release endorphins into the body, and can increase oxygen levels that help boost the immune system, control pain, and relieve stress. Children seem to have no problem laughing and having fun, but as we grow into adulthood and we face the stresses of life, we sometime forget to laugh. I think we should take Mary Rau-Foster's advice and have a little fun in the workplace. So maybe today you can take a moment at work to push aside your piles of paperwork and tell a joke, share a funny story, or just look at a picture of your grandchild. Just do something to bring a smile to your face.